Slice pizza effortlessly with our favorite pizza wheel. 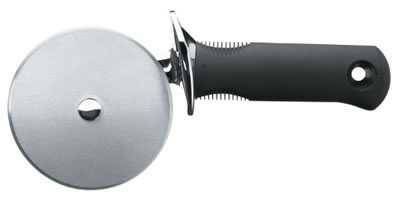 Next time you order pizza, tell them not to slice it so you can cut it yourself at home with a quality pizza wheel. The liquid running down through the cuts only softens the crust. Well priced and made to last, we found the OXO Good Grips 4-inch Pizza Wheel to be the perfect choice for home pizza cooks. A good pizza wheel will keep your pizza crispy, and it comes in handy for home made pizza and even for cutting pie dough. You want a big wheel like this one. It has a a solid riveted axle to keep it from wobbling, a good hand guard, and the Oxo's signature comfy grip.